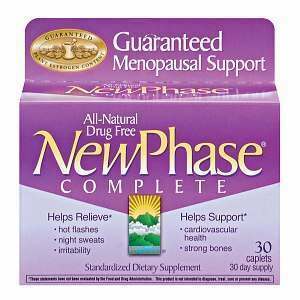 New Phase Complete Menopause Support contains, in addition to multiple plant hormone rich ingredients, vitamins and minerals, special isoflavone absorbing enzymes known as “isolase enzymes” which make isoflavones more effective in treating menopause symptoms. Chastetree Berry Extract – Stimulates production of estrogen and progesterone, and reduces symptoms like hot flashes, night sweats, etc. Black Cohosh root extract – Rich in plant estrogen and helps curb hot flashes, mood swings, excessive sweating and other menopause symptoms. Kudzu extract – Contains isoflavones, which balance hormone levels and reduce symptoms of menopause. Soybean extract – Contains isoflavones, which are like estrogen in their properties and help reduce menopausal symptoms like hot flashes, night sweats, moodiness, anxiety, vaginal dryness and atrophy, etc. Red clover extract – Contains plant hormones and regulates the hormone balance in the body. Reduces menopausal symptoms, has aphrodisiac qualities and is also used to boost fertility in non-menopausal women. Xylanase & Beta Glucanase (Isolase enzymes) – Help absorb isoflavones better. Vitamin D – Essential for proper absorption of calcium and maintaining bone density. Folic acid, Folate, Folacin – Prevents hot flashes and hair loss. Calcium – Essential component of bone and teeth. Prevents loss of bone density after menopause. Manganese – Helps maintain bone density. Boron – Helps increase estrogen levels a little and reduce some of the problematic symptoms of menopause. It also helps maintain healthy bones. Suggested daily dosage is one caplet per day for at least one month for any noticeable change. Not suitable for pregnant or lactating women. Contains soy and may cause allergic reaction in some people. This supplement may also interact with certain prescription drugs and a doctor should be consulted before use. Each 30 caplet pack costs $12.99. The company does not offer any guarantee or have any return policy for this product. This is a natural supplement containing multiple active ingredients, most of which are commonly used in menopause supplements. Jackie Horowitz	reviewed New Phase Complete	on August 1st	 and gave it a rating of 2.